In this quick tutorial, a Java dev shows us the ropes (or should I say threads?) of thread safety in Tomcat-based web applications. In the following, I want to show you how to test if your Tomcat web application is thread-safe. As an example application, I use Jenkins deployed on an Apache Tomcat 9.0. To detect concurrency bugs during our tests we use vmlens. vmlens traces the test execution and analyzes the trace afterward. It detects deadlocks and race conditions during the test run. Let us look at one of the races found, the race at accessing the field hudson.UDPBroadcastThread.shutdown. The thread "Jenkins UDP 33848 monitoring thread" reads the field in the race and the thread "localhost-startStop-2" writes it. Let us look at the class and the reading method run() and the writing method shutdown(). // makes people unnecessarily concerned, for a feature that currently does no good. 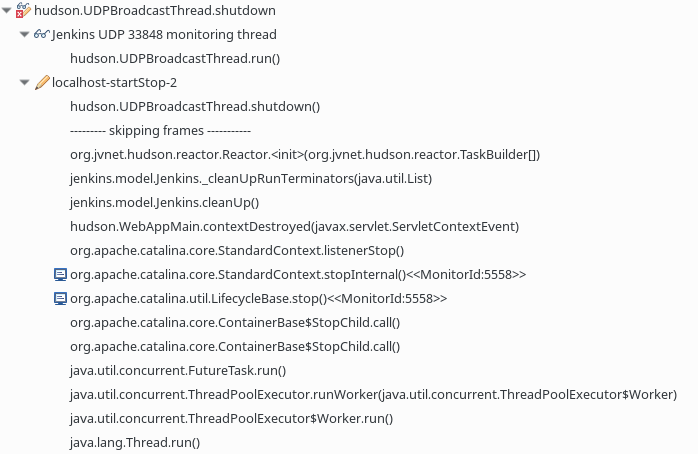 Since the field hudson.UDPBroadcastThread.shutdown is not volatile, it is not guaranteed that the "Jenkins UDP 33848 monitoring thread" sees the values set by the "localhost-startStop-2" thread. The "Jenkins UDP 33848 monitoring thread" might, for example, run on the first core while "localhost-startStop-2" runs on the second core of a multi-core CPU. The write to a normal field does not invalidate the cache of the cores. Therefore the "Jenkins UDP 33848 monitoring thread" still sees the cached old value.